At Ironmongery Experts, we stock a large range of deadlocks for entrance doors for use with both contemporary and more authentic doors and frames. 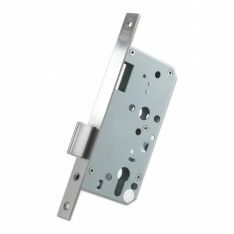 Designed with a single bolt and lacking a latch, mortice deadlocks are an earlier form of the more modern sashlocks, and are therefore usually installed as a secondary lock on entrance doors in the housing and commercial sectors. We have a diverse selection of other entrance door ironmongery products as well, from mortice bolts suitable for conservatory and shed doors, to more aesthetic items like letter plates. We also have the accompanying security hoods and letter tidies for those in search of the finishing touches. For a contemporary, easy to install approach, try our selection of nightlatches for entrance doors. These sturdy little fixtures are popular in residential settings, and can be changed without hassle if need be. For extras and accessories, Ironmongery Experts has you covered; everything from elegant door knockers to more unusual door setups like centre door knobs is available to ship straight to your door. And if you need any numerals & letters to add a bit of character to your home’s front door, we stock a variety of fonts and metal finishes. If your door doesn’t have a handle or doorknob, cylinder pulls are recommended for greater leverage, and door chains for entrance doors are always a wise investment. If you’re planning to install a bell, our range of bell pushes caters to a wide variety of tastes, and if you want that added bit of security, installing door viewers is never a bad idea. No matter what components you need for the job, Ironmongery Experts provides the most diverse range of high-quality models, designs and metal finishes on the market.